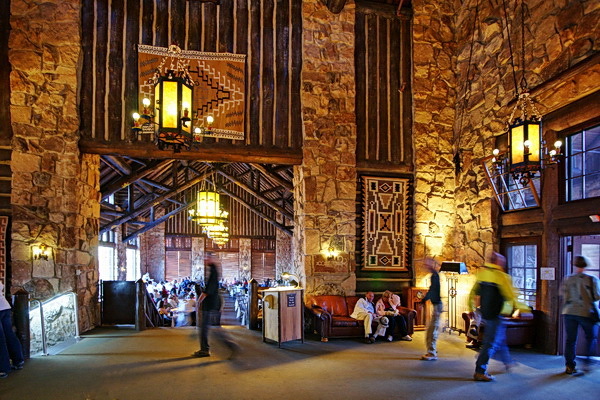 This is a shot of the lobby looking towards the dining room at the Grand Canyon lodge, north rim. It's not the best as there were too many people and objects in my way to get the shot I really wanted. I used the A900 with the Sony CZ 16-35mm F/2.8 @16mm. I see a small green ghost just above the guests heads sitting on the couch in the lower right. If I would've used the A700 and Sigma 10-20mm lens, which has superior ghosting control, the green ghost probably would be much smaller, or not visible at all. Unfortunately, that lens is a stop slower at the widest end, and would have forced me to use ISO 1600, a bit much for the A700's noise reduction system. Here I needed 1/6s, F/2.8, +1.3ev, AWB and ISO 800. I took about three shots at that speed, and all three came out sharp. Auto-focusing was spot on, although not a big concern at 16mm. There are some minor levels adjustments and straightening done (I can't hold the camera level). Color is as shot. Check out the next comparison, this time with the Sony Carl Zeiss 24-70mm and the Sony 28mm F/2.8 at 28mm (of course). The Sony CZ zoom looks sharper in the centers at wide apertures. The mid areas, (or approximately the APS-C corner areas) are easily sharper at all apertures with the Sony CZ zoom. The extreme corners are sharper with the Sony 28mm from F/2.8-5.6. Distortion is less with the CZ zoom. Ghosting is much better controlled with the Sony 28mm at all apertures. I've got a good jump on the Sony CZ 24-70mm F/2.8 and prime comparison comps that I promised last year---whoops. Well, work keeps getting in the way of my free time. I'm going to compare the Minolta AF 24mm F/2.8, Sony 28mm F/2.8, Minolta 35mm F/2, and Sony 50mm F/1.4 with the CZ zoom. This time we start off with the Minolta AF 24mm F/2.8 lens. As was the case with the CZ 16-35mm, the little 24mm prime is showing its age when comparing it to a new expensive zoom, but looks pretty good at F/8. In a nut-shell, the Sony 24-70mm CZ zoom looks marginally sharper in the centers at all focal lengths, although the Minolta AF 24mm F/8 crops are very similar. The mid areas, (or approximately the APS-C corner areas) are easily sharper at larger apertures with the Sony CZ zoom, and are only slightly sharper stopped down. The extreme corners are sharper with the Minolta from F/5.6-11. Distortion is basically the same. Ghosting is much better controlled with the Minolta at smaller apertures. Eh, better late than never right! I work during the day (mostly) so I can't update stuff 'til the evening. Sony pulls the cloth off their newest camera system, calling it NEX, with a new mount, this time an "E" to go along with the "A." The next one will have to be an "I" am I correct? As I gaze at the pretty pictures, and specs, I'm thinking this may be a really good alternative to the "to big for comfort" current DSLR systems. The reviews are pretty good, and it seems Sony may finally have a better noise reduction process than past models. Go here for a good ISO comp. Weird, but the lenses don't seem all that small, in fact, the 18-200mm specs indicate it's larger than the current "A" mount lens. The "E" mount kit 18-55mm is slightly smaller than the current kit lens. I'll have a review of the NEX-5 when it becomes available, along with most of the accessories below. It's supposed to be released in July. Comes with small, add-on flash. Not shown is a small black body cover. I see an add-on, 5 element glass optical viewfinder, cost not available yet. Stereo mic with wind screen. 16mm F/2.8 pancake lens, equivalent to 24mm, costs $250 separately. Fisheye lens attachment, 4 element (0.62x) for 16mm above, equaling 15mm. No price yet but I'll bet it's $150-$200. Wide angle attachment (0.75x) for 16mm above, for an equivalent of 18mm wide, probably will cost about the same as above. Kit lens 18-55mm F/3.5-5.6, about the same size as the current "A" kit lens. Costs $300 if purchased separately. Zoom 18-200mm F/3.5-6.3 actually larger(!) than the current "A" mount lens, costs about $800 coming in the fall. Lens adapter for "A" mount. Will not support AF with either screw drive or SAM/SSM. Has tripod mount on bottom. 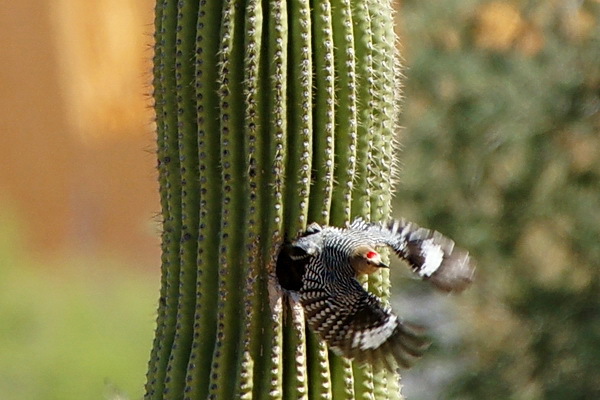 Gila woodpecker flying out of nest in Saguaro cactus. This image was taken with the Sony 70-400mm @400mm F/5.6. Obviously, I could've used more focal length here to make this a decent shot, but I'm not posting this image because of the overall image quality, I'm attempting to draw your attention to the background on either side of the cactus. If people just saw the left side of the image, some might conclude the background blur or Bokeh of this lens is "super smooth," or "creamy" or some such term. In fact, when I speak of background blur, I'm talking about the character of out-of-focus highlights, not simply how out-of-focus the background is. On the right side of this image, (closer than the left side) we see some not so smooth out-of-focus highlights, the result of light showing through tree leaves just behind the cactus. The left side is simply rendered smooth by being way out-of-focus. There is a difference. Go here to find out more. I've put February and March homepage entries into the home page archives. If you saw something you liked in those months, or other months, you'll find it in the archives. Original or restyled? Ever wonder what the differences are between the original Minolta prime lenses, and the restyled (new) versions? Me too. Well, I was able to compare both versions of the 35mm F/2 and posted this quick comparison page. If you don't have time to view the page, I'll sum it up here. The new version gets a circular aperture, updated lens coatings, and a wider focus ring. I believe the 28mm F/2 was updated the same way, and probably the 50mm F/1.4, 20mm F/2.8 and 24mm F/2.8 also, maybe more, I'm not sure. I'm assuming the new or "restyled" Minolta versions are the same as the Sony versions, like the Sony 20mm F/2.8. The only noticeable differences are; when the sun is in the shot, the updated coatings are better at controlling ghosting, but only when the aperture is stopped down some. The bokeh quality is the same, but instead of heptagons, you get circles between F/2.8-4---F/2 looks the same, as well as F/5.6 and smaller. Just for fun I did a center and corner crop comp between the lenses, and they came out nearly identical, which is a little surprising, maybe Minolta/Sony quality control is better than one might imagine.